Troy Renken, VP at ZPower, will discuss the barriers and enablers of wireless technology adoption in Audiology. CAMARILLO, CA – September 16, 2014 –Troy Renken, VP of Product Planning and Electronics at ZPower, will give a presentation on the barriers and enablers of wireless technology adoption in Audiology at the 2014 International Hearing Society (IHS) Convention & Expo. The convention takes place September 18 – 20 in Palm Springs, California. Troy Renken’s presentation will occur on September 19 from 10:45 am – 11:45 am. It will focus on wireless technology features and the impact on battery use. Once considered a “special” feature, wireless applications are now available in approximately 75 percent of all US hearing aids dispensed. A common perception among many in the hearing industry is that wireless features are not utilized to their full potential. Mr. Renken’s presentation will describe the wide range of wireless features available today and look at the possible reasons for lower usage. It will also explore the importance of battery life to advanced wireless hearing instruments. IHS 2014 is the premier event for Hearing Instrument Specialists. The three-day convention brings together members that represent hearing healthcare professionals worldwide. IHS members are engaged in the practice of testing human hearing and selecting, fitting and dispensing hearing instruments and counseling patients. In addition to Mr. Renken’s presentation, ZPower will exhibit at the IHS Convention in Booth F612. The company will conduct a new survey on Hearing Instrument Specialist experiences with hearing instrument batteries. ZPower is a leader in the development of rechargeable, silver-zinc batteries for microbattery applications whose headquarters and manufacturing facility is in Camarillo, CA. The company provides a total solution for hearing instrument manufacturers which includes advanced silver-zinc battery technology and charger design support. The ZPower solution simplifies new product development and speeds time-to-market. For end users, ZPower batteries deliver unmatched performance, improved user experience and are better for the environment. 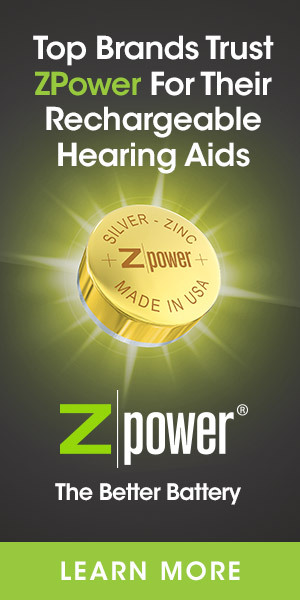 For more information, visit www.zpowerbattery.com or the ZPower Expo Page on AudiologyOnline.